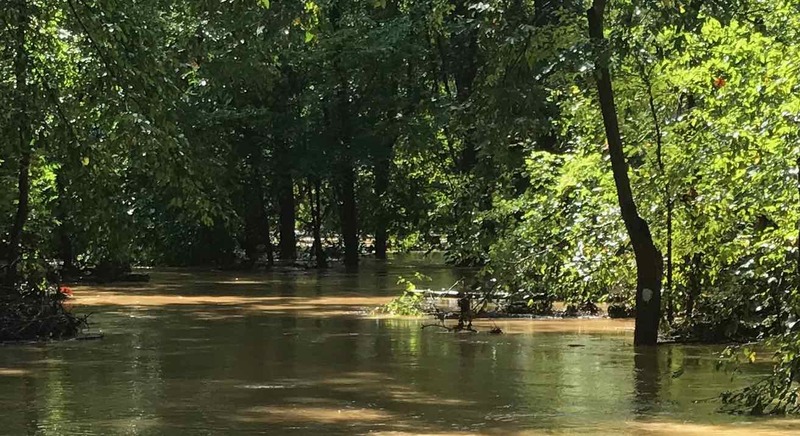 In the aftermath of Hurricane Florence, land managers are working hard to restore access to public lands, but conditions remain dangerous, particularly in the eastern part of the state. Our trail volunteers are beginning to assess damage, and will begin to plan workdays to address storm related issues. We do not expect reports from the Coastal Crescent soon, as our volunteers there are focused on recovery. Most facilities in the western part of the state have reopened, as have most NC State Parks. Jones Lake and Singletary Lake remain closed. Most roads and facilities on the Croatan National Forest, including the Neusiok Trail, are closed and will remain closed until further notice. For a listing of all reported trail issues, click here. Many of the other public lands the MST crosses may be closed as well, and many land managers are urging people not to use public lands even if they are not officially closed. We also encourage people to stay safely away from the MST until conditions are cleared. If you do go onto the trail and encounter dangerous conditions, please let us know at info@mountainstoseatrail.org so we can let others know and repair the conditions. There are very few stretches of this 1175-mile path across our state that haven’t been affected by Florence. We are connected from Clingmans Dome to Jockey’s Ridge by a path that unites our communities and people. Even if you weathered the storm well, follow the white dot down the trail and you would meet someone who didn’t. Hold them in your thoughts and help them if you can. Thanks for supporting the MST, and above all, stay safe.